A high school friend paints a different picture of Amer Sinan Alhaggagi, an Oakland man indicted by the feds for terrorism charges. NBC Bay Area’s Investigative Unit first broke the news that the 22-year-old Alhaggagi, a Berkeley High School graduate, was indicted late last week for attempting to provide support to the terrorist group ISIS. Ray Martinez, who was just 14 when he met Alhaggagi, spoke exclusively to NBC Bay Area on Tuesday. Martinez said he cannot believe his friend has been indicted for terrorism charges and does not know if he ever will. Martinez first met Alhaggagi during a soccer class at Berkeley High when the two were freshmen. A young Oakland man arrested last year on terrorism charges conspired to kill 10,000 people across the Bay Area by blowing up gay clubs in San Francisco, planting backpack bombs on the UC Berkeley campus, setting fire to the Berkeley Hills and selling cocaine laced with rat poison, according federal court records obtained by NBC Bay Area. Liz Wagner reports on a story that first aired on July 25. "He was one of the first people I met at Berkeley High School," Martinez said. He added Alhaggagi was playful, friendly and not the person described by a federal agent during a December court recording. Federal prosecutors in the December detention hearing recounted in detail conversations dating back to last July that Alhaggagi had with FBI informants posing as ISIS sympathizers. Court records go further and said Alhaggagi had a goal to kill 10,000 people and target San Francisco's Chinatown, downtown and Mission Street -- quite the opposite to the person Martinez remembers. "It's shocking," Martinez said. "I wonder how much of that he meant, and how much he might have just said for wrong reasons." Martinez also said Alhaggagi "always stood up against bullies." He wonders if his old high school friend began to see the United States as a bully. "I think there has to be some degree of truth to what happened," Martinez said. When asked if the boy he met on that soccer field eight years ago changed, Martinez said "it's hard to say to what extent. I have conflicting thoughts about it." 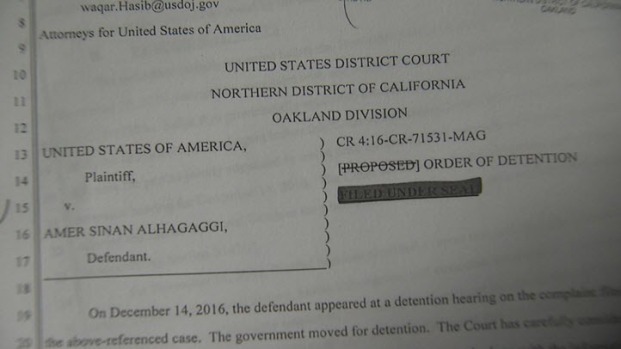 Alhaggagi's attorney told NBC Bay Area his client was coaxed into the conversation by undercover agents and that his client does not support any terrorist organization. Liz Wagner and Michael Bott contributed to this report.